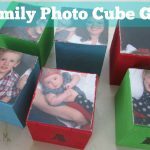 I have a last-minute Father’s Day gift idea for you! About a year and a half ago, I was listening to a commercial about a shaving club that delivers razors to your door. (No this is not a post about razors!) In the commercial they also mentioned their amazing shave butter that was better than anything else for shaving. They said they could never go back to regular shaving cream. I decided I needed to investigate shave butter because it sounded wonderful! 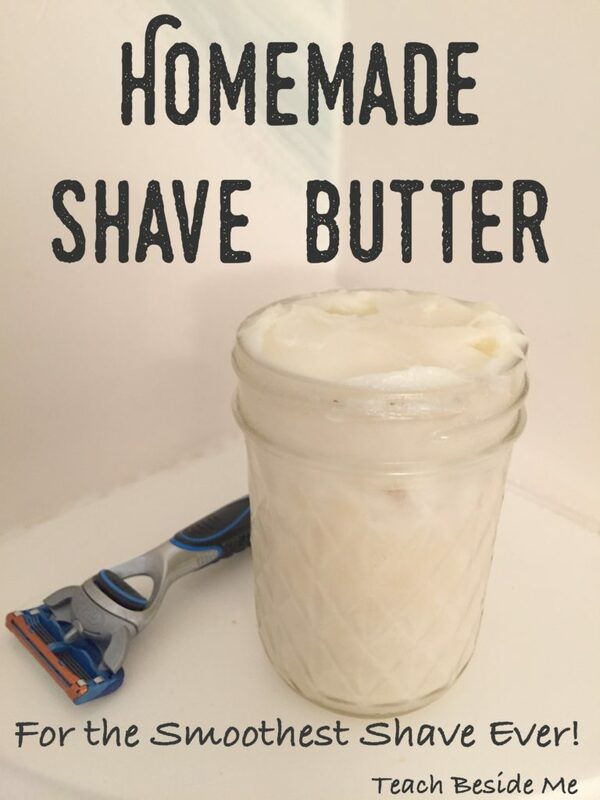 In my research, I discovered it is VERY easy to just make homemade shave butter. And I already had the ingredients in my house from other homemade body products I had made in the past! I made it first for my husband for a Christmas gift. I think it has been one of his favorite gifts I have ever given him, because he continues to ask me to make more. After I saw ho much he liked it, I have been making it for myself, too. It has solved all of my old razor burn issues I used to have and I am in love just as much as he is! It makes my skin so smooth after I shave! After that long intro, I am sure you are wondering what is in the shave butter and what makes it so special?! You are going to be amazed by how easy it is. It has just four ingredients. 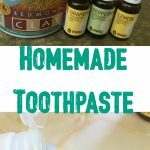 For my husband’s, I like to use a combo of peppermint (It’s on sale this month!) and rosemary or cedar wood essential oils. For my shave butter I use grapefruit and orange oils or this awesome Baby Skin blend from Rocky Mountain Oils. I adore the scent and feel of it! Melt in a saucepan the Coconut oil and Shea butter. Remove from heat and add in the Almond oil and essential oils. Cool for several hours, and/or refrigerate to harden. If you have time, I prefer to just let it solidify on its own. Once it is solid, let it soften (if you refrigerated it) and you can whip with electric beaters for a few minutes it to give it that soft lotion-y texture. If you let it harden on the counter, you can just stir it to get the same texture. 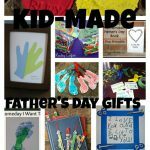 Want another homemade Father’s Day gift? 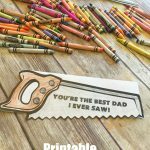 Check out our Dad String Art post! It is simple & great for your skin!! This stuff is the bomb! I have really sensitive skin and tried other shave butter and it worked great but I had to order it and I wanted something that was more readily available. I ran across this recipe, and I am greatly impressed. A perfect shave with no butchered skin and my skin was very soft and smooth with a great peppermint aroma. How long does this last if my husband doesn’t shave everyday? It lasts quite a while! I make it every other month probably. I made a batch last night but this morning it still had not hardened. I had left the mixture on the counter without a lid overnight with a house temperature of 64 F. Any Ideas what may have went wrong? Try refrigerating it! Sometimes in the Summer mine does not harden as well, either. Does this recipe make one jar? I want to make 10 jars so I’m curious how much ingredients I will need. What am I doing wrong? I let it cool and the Shea butter sinks to the bottom and hardens with the oils on top. Just mix it a few times while it is cooling. Cocoa butter is a great alternative if you can find that! It may be too late but I have found Shea butter on Amazon. Would cocoa butter lotion be okay? Does this lather? Would you apply it with a shaving brush? Thx. It does not lather, it is more of a lotion-type consistency. I have never used a shaving brush, so I am not sure about that part. I just rub it on. Mine turned out a dark yellow color I think because of the Shea butter but I used the same ingredients you have pictured. Will it lighten when I whip it? How did yours come out creamy white? Did you use a different Shea butter than the one pictured? Yes! It definitely lightens as it cools. Could you add menthol to this for a cool feel? You could certainly try! I like peppermint oil for that purpose. hi, i tried to make this and it never solidified, it remained a liquid similar to oil. If i put it in the refrigerator it hardened but when I took it out it went back to the liquid form. What did I do wrong? I am sad as I have now tried it twice with the same result and a terrible waste of money in ingredients. I used African shea butter, coconut oil, olive oil and essential oils. Oh darn! I have never had mine not solidify. Do you live in a very warm climate? Maybe try reducing the olive oil and/or increasing the shea butter a bit. 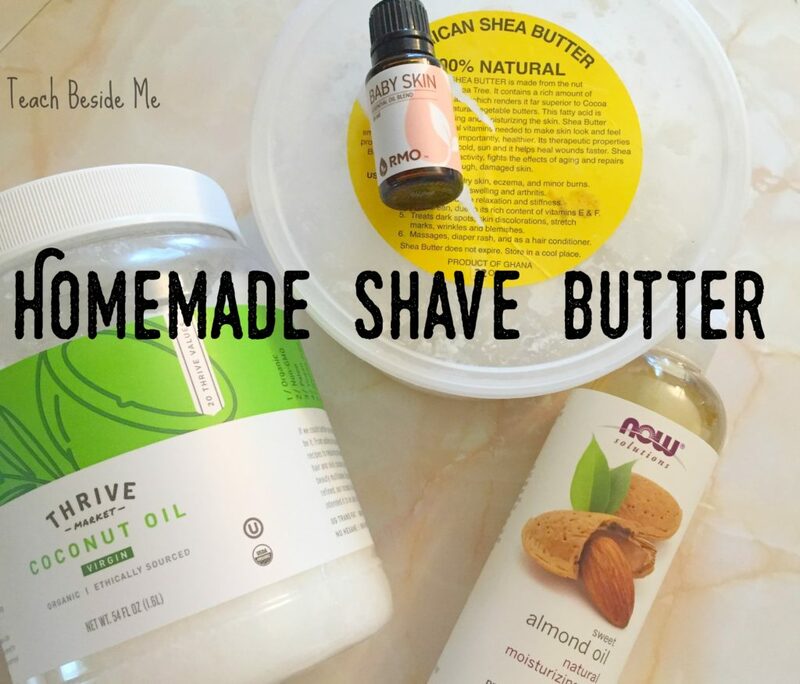 You can re-use those ingredients, just add in extra shea to make it a more solid form. Help! I made this for my boyfriend. The only thing I did different was microwave to melt and then I added a dash of vitamin e oil. For some reason, it never solidified! I put it in the fridge and it did, but when I took it back out it just melted again. Any ideas?? can I use cannabis oli instead olive oil? I have never tried it, but it would probably work just fine. Mine never solidified either and it was light brown in color. My daughter made it for her dad, my husband , for Christmas. We spent $40 on ingredients, so it’s very disappointing. Do you have any suggestions on how to keep the guys razors from clogging up so fast from the oil? I just rinse it in hot water & it comes right off.